To read an image from a scanner or other device you select the appropriate software module for your hardware from the Device list. Next you press the button Acquire. The image will now be read and will be displayed in the gray area. To read an image from the file system you use the button Load. 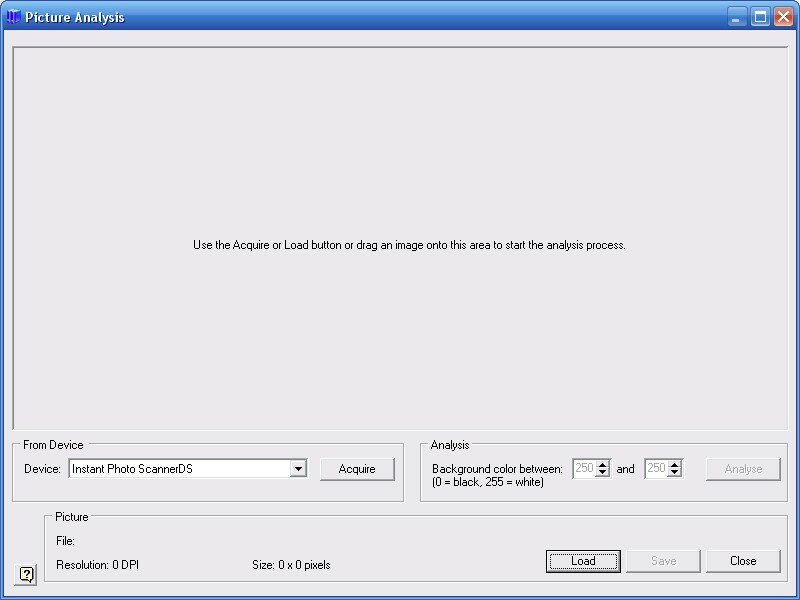 Using the dialog screen that will be shown you select the image(s). After selecting the image(s) the image(s) will be displayed in the gray area. To read an image from another software package you drag the image from the software package on the gray area directly. It is also possible to drag images from Windows Explorer onto the gray area. As soon as the image has been read its resolution and size in pixels is displayed. Furthermore the color intensity range of the background is determined. After that the analysis process will start. You can save images to the file system for later (re)use by using the button Save. You can close the screen with the button Close. In this area images that are read will be displayed. Images can also be dragged from other software packages, like Windows Explorer, onto this area. List with software modules for your devices, like a scanner or digital camera, from which images can be read. With this button you start the reading process from the selected device. First the software belonging to your hardware will be started. In this software you can set several parameters for the reading process like resolution (DPI) and contrast. After you have set the parameters Stamp Album Studio will read the image. The setting "Background color" determines which color intensity range for the background color will be used. Pixels on the screen that have a color intensity that lies outside this range are supposed to belong to a stamp. The intensities are gray values with a scale division from black (0) to white (255). Normally a scanner has a white background which means that the setting will have a value of approximately 250. However, if you have placed a piece of paper on top of the stamps to reach a higher contrast a different value must be used. The function "Scan and analyse" will determine this setting automatically by investigating the colors in the upper and lower border of your scanner. Therefore you are advised to avoid placing stamps within 1 cm off the upper and bottom border. In case the setting has an incorrect value you can change it manually. (Re)starts the analysis process. By the way, as soon as an image has been read the analysis process will start immediately. If the image originates from the file system the file name will be displayed here. Resolution (DPI) of the image that has been read. Horizontal and vertical size of the image in pixels. This button opens a dialog screen to read image(s) from the file system. This button opens a dialog screen to save an image to the file system. This button closes the screen.